Shop online and pay less for standard size molybdenum and tungsten sheets and rods. Navigate the menu on the left to make purchases. We stock molybdenum rods 12" and 36" in length with different diameters. 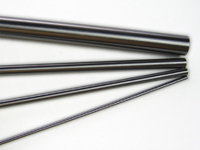 The surface of the moly rods can be either regular or polished. Checkout is handled by Amazon. Customers can pay through Amazon.com or directly with a credit card (link is on the left side of the check-out page). International buyers - please contact us for shipping quote before placing order! We try our best to keep every product in stock. However, some items may require a lead time of 1 month due to unexpected variation in demand. We also have an eBay store and we are a PowerSeller! Shop eBay instead. Couldn't find what you need? Why not ask us about it!